Who can forget toy trains? An annual viewing of "Polar Express" always makes me nostalgic for the trains I knew as a child. My father had a Lionel train that he let us play with. My older sister had a wooden train that we all played with. 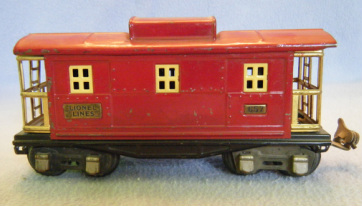 I received an HO scale train from a company Christmas party when I was 5. My buddy across the street had a very elaborate N gage diorama that filled a good portion of his basement. My own children grew up with Thomas the Tank Engine and Friends and have collected many of those characters. 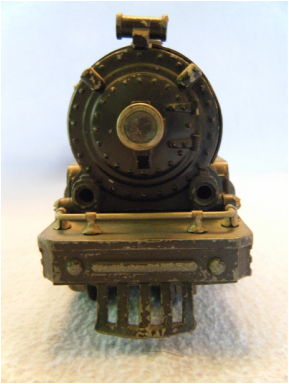 My father received his Lionel steam locomotive when he was 5 years old (in 1932). He said he was so excited he could hardly stand it. He used to keep it set up on his family's ping pong table. All of my brothers and sisters have played with that train at some point in their lives as well as many of our children. It is now displayed in my father's office, where all of us can look at it and travel back in time to when we could hear it thundering down the track and smell the ozone from the transformer. 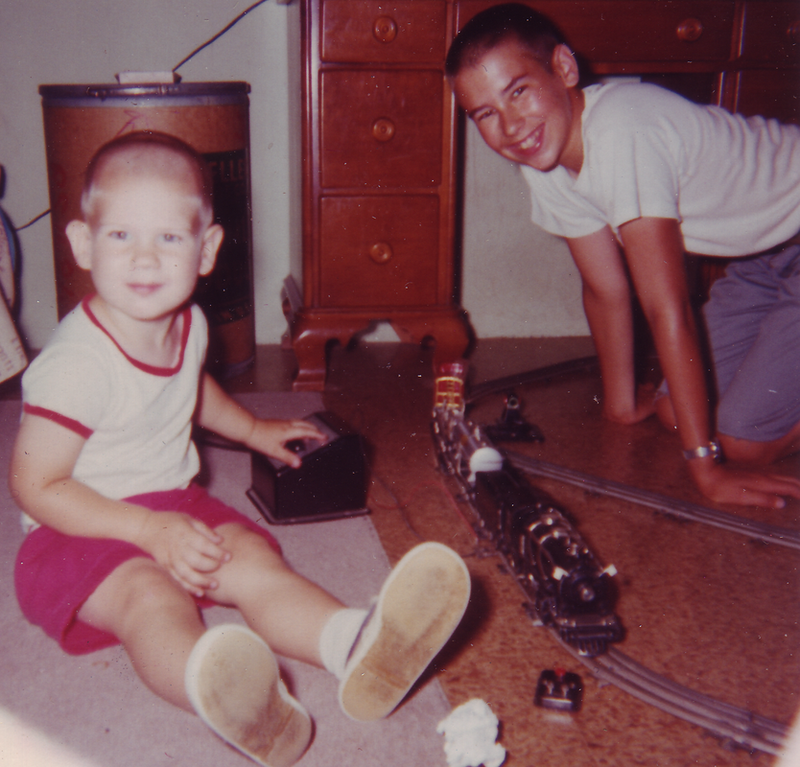 I was 2 1/2 years old when my older brother (13 years) set up my father's Lionel train for me for the first time. The engine is very heavy. It used to scare me when it would topple off the track when taking a turn too fast. The forward and reverse switch is missing from the slot directly in front of the cab. This engine came before the type that created "steam". The two white flags are missing from the front of the engine. 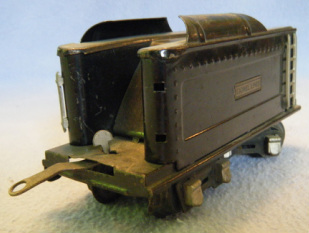 My Dad broke off the left and right sides of the cow catcher when he accidentally dropped the train when he was a boy. The front light burned out and is now missing. 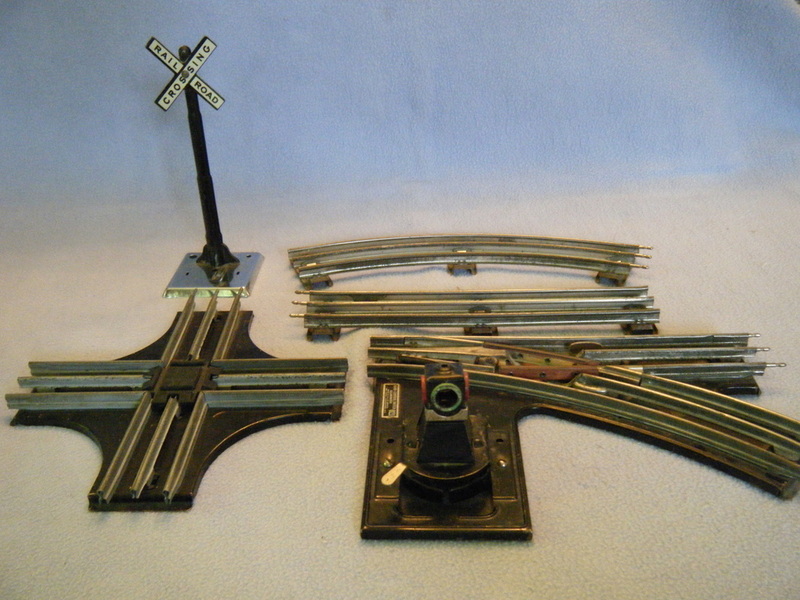 Representative pieces of track. The track could be laid out as a giant oval, a circle, a figure 8, or an oval inside an oval (using the switch tracks). The metal crossing sign came with the train. 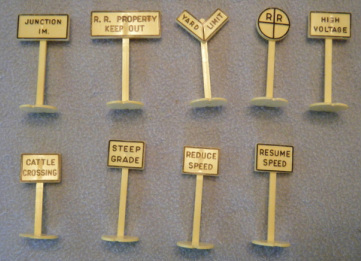 These plastic signs must have been added later. The train also came with a mountain tunnel that had arched openings. My brother says that there was a foot path that crossed the mountain. The tunnel is now gone. We also used to keep cars and knick knacks my grandfather got to keep from General Motor's Futurama exhibit at the 1939 World's Fair in New York. They were futuristic and not to scale with the train but they were fun to play with. The front of the engine pops open so the light bulb can be changed. 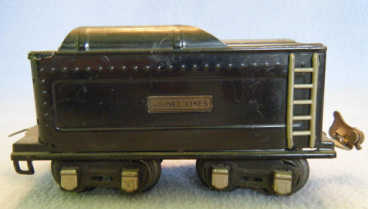 Corner view of the Tender. 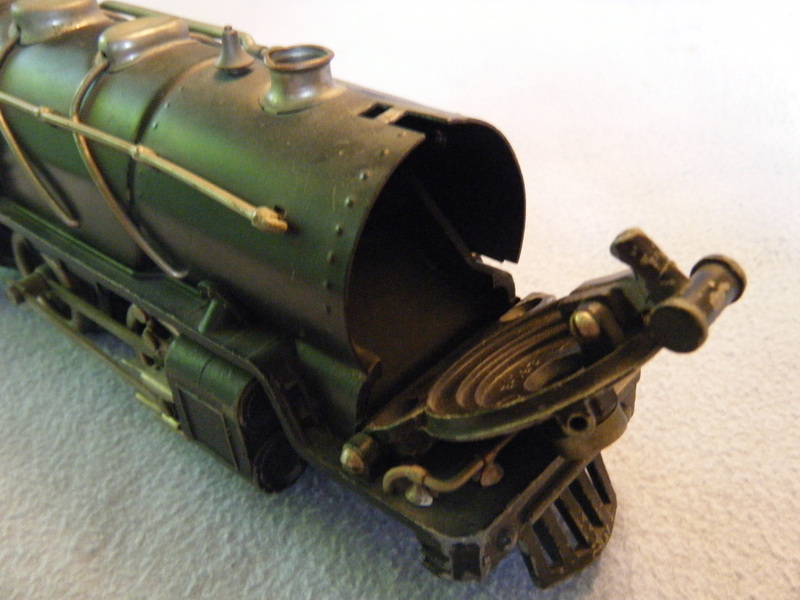 Notice that the coupling can only connect to the engine. 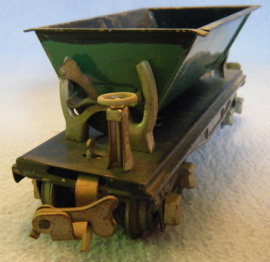 The Hopper has latches that allow it to dump to the right or to the left. Notice the little hand wheel as well as the coupling. 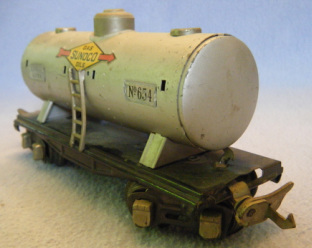 The tanker is missing some pieces (notice the holes along the mid-section. 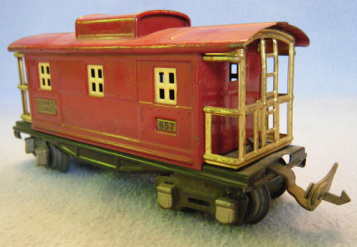 The color scheme of the caboose is very eye-catching. You can't help but want to look inside the windows. Various electrical connectors as well as an example of the connector that would keep the pieces of track from popping apart when the train crossed the join. 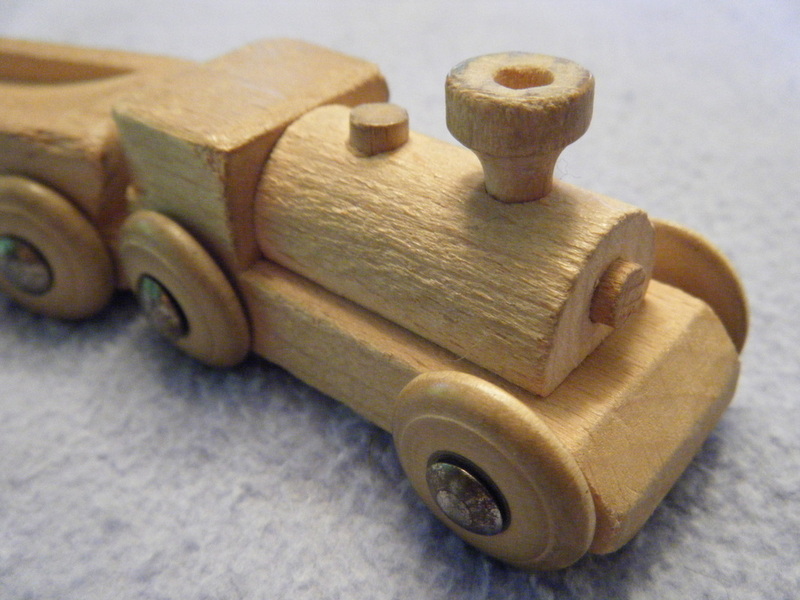 My sister's wooden train was made in Japan by Borel. It is impressive that she has kept it largely intact over the years. 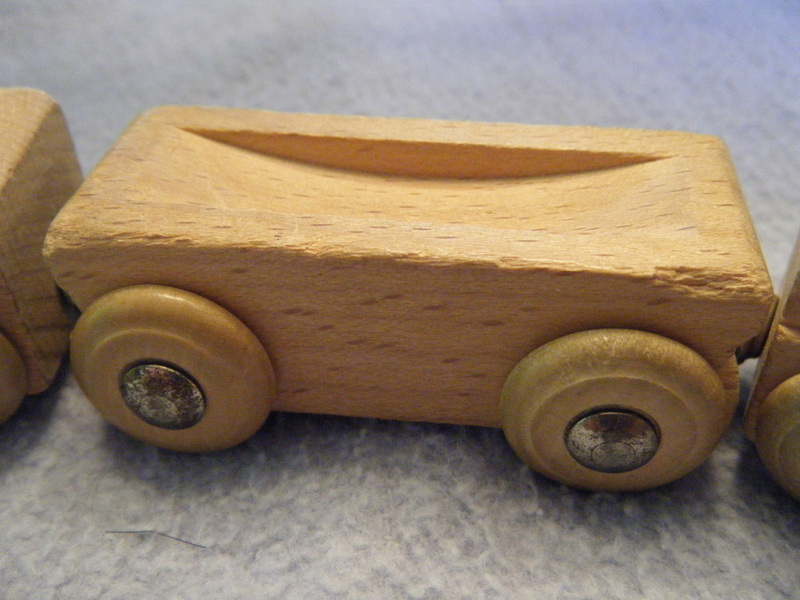 It is very similar to the wooden trains made by Brio. My older sister looking pretty pleased with her Christmas haul. 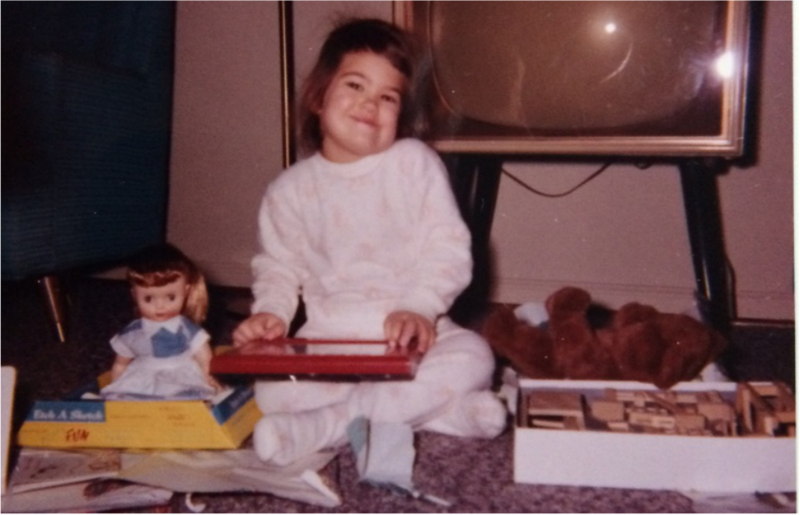 She received the wooden train set as well as a doll, a bear, and an Etch-A-Sketch. 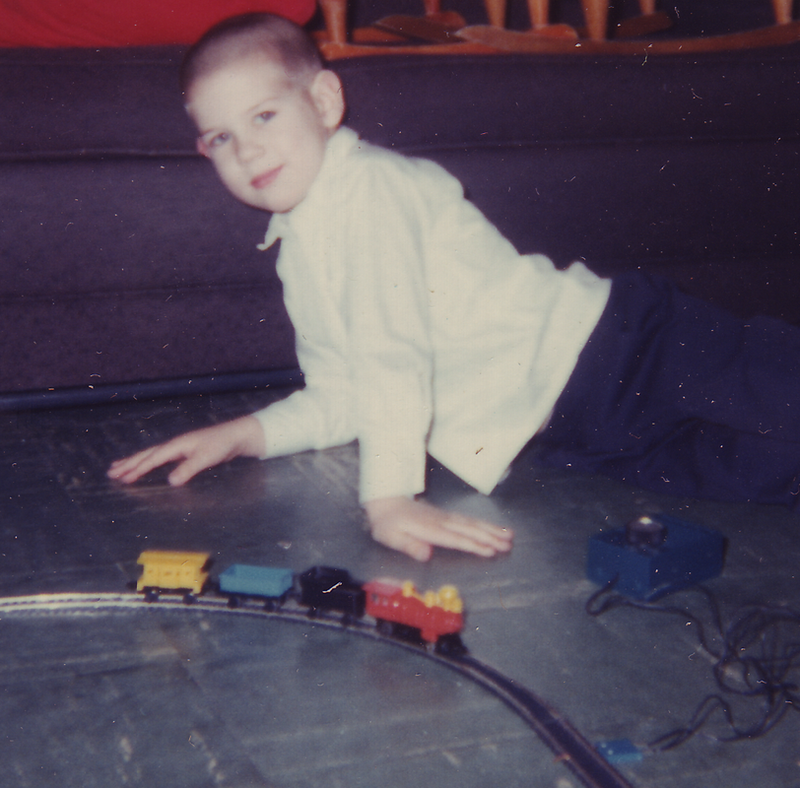 I received my own electric train from a Christmas party hosted by my father's employer just before my 5th birthday. After the transformer gave out I kept the train displayed on a piece of track mounted on the holey board by my top bunk. I don't remember what became of the train. Most likely, I gave it to my youngest brother.